If you want to know what it's like to meet ASIMO in person, we'd recommend checking out Jake Schreier's Robot & Frank. There were moments during our presentation where the similarities between ASIMO and the film's own little white bot were uncanny. Like, scarily uncanny. The latest generation of Honda's ongoing robot project, now dubbed the All-New Asimo, is its most lifelike and impressive yet. It moves like a person, it talks like a person, and its more rounded shape is the closest to the human form as it's ever been. In a giant studio on the outskirts of Brussels, ASIMO enters the room to a round of awkward clapping, as if people aren't exactly sure why they're applauding a piece of machinery. The robot walks around the floor for a few minutes as a Honda rep explains all of the improvements that have gone into the new ASIMO. Enhanced hand and leg dexterity, higher intelligence, and faster movement are just a few of the upgrades. It can also now differentiate between faces and voices of people speaking simultaneously, in both English and Japanese. Note that we're referring it ASIMO as 'it'. Honda hasn't bestowed a gender on its little white person, and when it starts to speak it does so in a child-like like voice that could be coming from either a boy or girl. We want to give it a hug but it feels like a trap. ASIMO then walks over to the staircase in the corner of the room and begins to make the ascent. Many of us remember that disastrous day of 2006 where ASIMO demonstrated how to tumble down steps. But making ASIMO do the stairs before the drink-pouring demo pays dividends, as it successfully makes it to the top and stands proud, like Edmund Hillary in space get-up, conquering its own Everest. Once back on the floor, ASIMO walks closer to us and starts jumping on the spot like an excited child. Now it's hopping on one foot. It's just showing off at this point. As for what happens next, we're still not sure if we're more impressed or terrified. ASIMO displays its new top running speed of 5.6mph, first going from one side of the room to the other, and then from the far wall straight towards us. For a moment we're not sure if it's actually going to stop. This could be revenge for all the laughter on that fateful day in 2006. But ASIMO has forgiven all, and gently comes to a standstill in a way that you or I would. A Honda rep then places a football in front of ASIMO, who proceeds to kick it (with a fair bit of force) at the wall. You may have already seen ASIMO playing football with Obama but it's a demo we'll never tire of. We're almost at the end of the demo but not before the final trick: ASIMO busts out some seriously funky dance moves. We have to hand it to the little bot, it throws better shapes than we can. 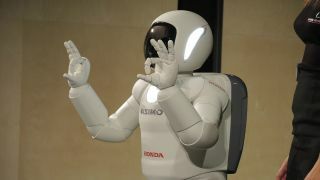 We considered taking ASIMO out dancing on the town but Honda's not too receptive to the idea. If we put some clothes on it, could we sneak it out? ASIMO is more lifelike and contextually-aware than ever, and Honda is no doubt already ploughing ahead to the next stage. But this isn't just a project for kicks; Honda sees today's demonstration as another step closer to a robot that will have practical use in the home environment. This is your official warning: the robots are most definitely coming.